If you’re looking to cook Roast Beef like you find in restaurants, you’ve come to the right place. I’ve tried every cut of beef and seasonings over the years and this is the end results. 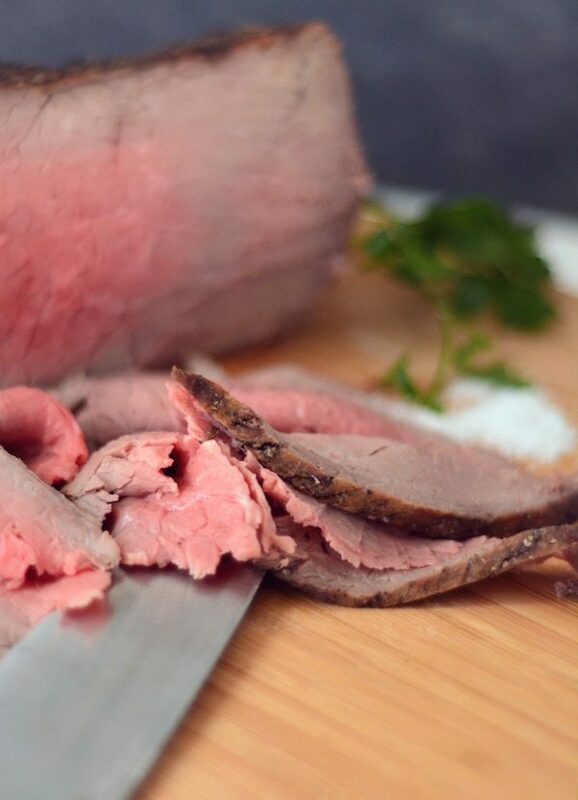 This Roast Beef Recipe is PERFECT for our Roast Beef Sandwiches, French Dip Sandwiches or as a main dish on holidays. It’s also VERY similar to our Prime Rib Recipe, that we’ll post at a later date (stay tuned!). Tip – Hands down, boneless rump roast is the way to go for this recipe. If you already have round roast or sirloin tip on hand, it will work as well, but it’s not as “melt in your mouth”. Mix the salt, pepper, thyme, basil, rosemary and garlic powder together in a small bowl and set aside. Add the water and beef stock to the bottom of a roasting pan. Add the rack to the roasting pan and place the roast, with the fat side facing up, on the rack. The roast should not be touching the water/beef stock mix. Transfer the roasting pan to the oven and cook for 55-65 minutes or until the largest part of the roast reaches 135 degrees. Do not open the oven during this time. Remove the roast from the oven and cover with foil. Let rest for 10 minutes so the temperature rises to 145. When ready to eat, slice across the grain as thinly as possible. Enjoy immediately or place it in the refrigerator covered for up to 3 days. 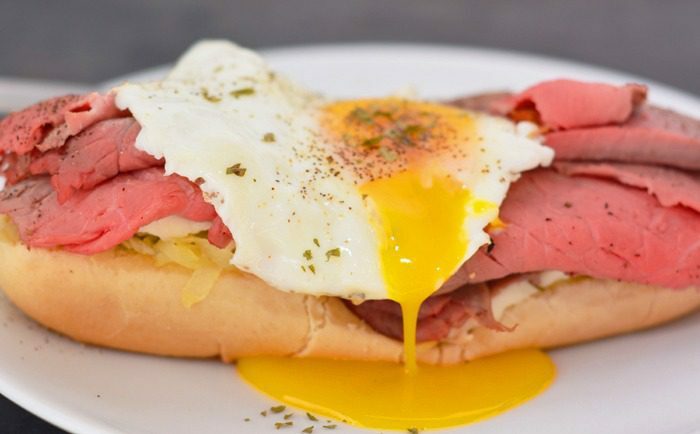 Use the Roast Beef for these tasty Roast Beef Sandwich with Egg and Hashbrowns!